Cars will enter the parking lot off of Creekside Place, coming from either direction. 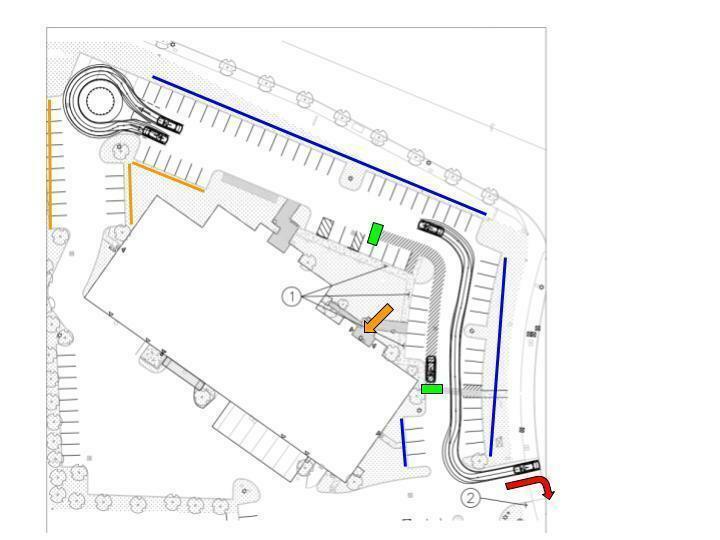 Drive into the parking lot, past the main door, and into the circular turnaround marked with striping and yellow traffic buttons, then return along the front of the building until you reach the drop off area. All drivers pulling into the drop off area will let their kids out as soon as they stop (we try to move cars into loading zone in batches of eight). The drop off zone is the space between the two green boxes on the circulation plan. Your child needs to exit the car from the right side only. Please follow directions given my car door attendants as to when to stop and drop off children. Students will enter the school through the main entry, indicated by the orange arrow. When you leave you must turn right, per city regulation, onto Creekside Place, as indicated by the red arrow. Heading south on Creekside Place you then turn left onto SW Stratus St., which will dead end at Nimbus where you can turn left (toward the traffic signal at Hall Boulevard) or right. When you pull into the drop off area it is expected that the student(s) in your car are ready to jump out. This means that you will need to take care of having them gather their items, share goodbye wishes and kisses, unbuckle, and be ready to go starting when you pull into our parking lot. Children must exit out of the right side of your car. DO NOT ARRIVE BEFORE 3:15 PM (M, T, TH, F) and 2:00 PM for WED. RELEASE, OR YOU WILL BE ASKED TO MOVE. 2:45 pm (M,T,Th,F) and 1:30 pm (W) is the latest a student may be picked up for early dismissal, so as not to interfere with afternoon procedures. DO NOT enter into the car queue before the scheduled time. This is important as we do not want to back up Hall Blvd with cars just waiting in the queue. It is very important that everyone have a family ID# - Even walk-up parents. Parents “walking up” to retrieve their children don’t go to the front doors. Go to the designated space labeled WALK UP PARENTS to the right of the front doors. Please do not call the office and request the school to deliver messages about last-minute carpool changes to students. Please make arrangements in advance with friends for last minute emergencies. Do not park in any of the neighboring businesses; parents may choose to park on SW Stratus Street or some other public and legal parking space and walk to the school. If your student is a “Student walker” (unaccompanied) the will be escorted to the school crosswalk in our parking lot. If you are walking to the school to pick up your child, they will be kept in their classroom. Do not tell your child to walk out and meet you at the walk up area. They will be called per their number listed in the queue. Every time an adult comes to school they must check in to the main office and get a visitor sticker. ORS 164.245 requires all visitors to check in to the main office. Please make an appointment with the teacher if you are planning to visit your child’s classroom. Students and parents must make an appointment with the teacher if they are planning to drop off items before the school day begins. Thank you all for your patience during this exciting and challenging time at our new building!